Sarasota Storm is having its entry level triathlon at the beginning of February. Do the winter blues get you down? 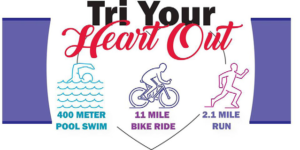 Tri Your Heart Out is a great way to dip your toes into the world of triathlon, or jump back in after the holidays. It’s an affordable, safe, friendly race designed for first timers and those who enjoy having the rest of the day to relax. No fancy bike or spandex needed, no pressure, just a good time swimming, biking, and running! Tri Your Heart Out is designed to make a first timers’ experience top notch and inspire them to continue in the sport of triathlon! Our members volunteer for this race so participants will be in good hands with experienced triathletes there to answer questions, give direction on the course and cheer racers to the finish line. Tri Your Heart Out Triathlon is on Sunday, February 11 at the Potter Park YMCA, Potter Park Drive, Sarasota. Visit sarasotastorm.org/events/ytri, for registration and information.